Half-pipe snowboarding is an aerial acrobatic routine performed by snowboard athletes on a half-pipe constructed of snow. Although the dimensions of snowboard half-pipes vary within different mountain resorts, Olympic and World Cup standard half-pipes are generally 160m in length, 18m in width, 6.0m deep on a gradient of approximately 18 degrees. (see Figure 2) The objective in recreational and competitive half-pipe snowboarding is to perform well executed and stylish routines consisting of complex aerial acrobatic manoeuvres that are executed as high above the half-pipe lip as possible. Performances within a recreational, training or competition environment are currently assessed via subjective measures from a panel of judges. Previous work by Jason Harding however has found a link between total air-time (TAT) and average degree of rotation (ADR) achieved during elite half-pipe snowboarding competition show strong correlation with an athlete’s subjectively judged score using labout intensive video based methods. 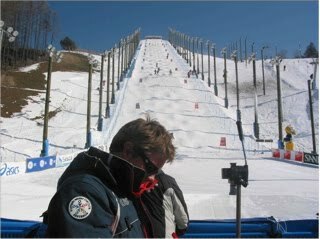 This paper has focussed primarily on providing sport scientists and elite level coaches the capacity to routinely monitor half-pipe snowboarding performance in the field using micro technology sensors, now emerging in routine use in sports science applications.